We found this card in a collection and probably one of the most unique variations that we've seen on a Pre-War card. 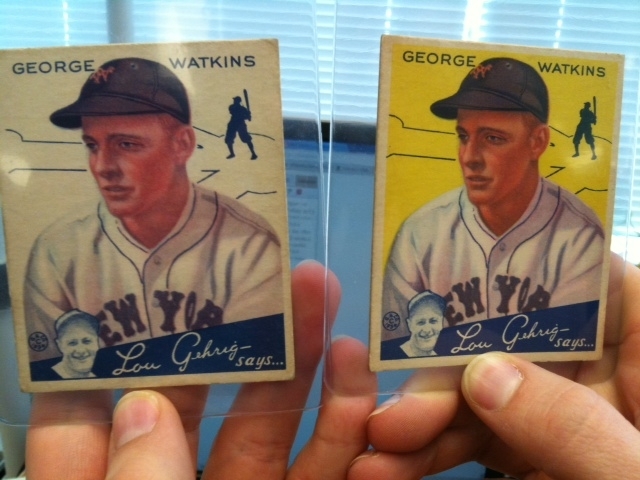 The card is a 1934 Goudey # 53 George Watkins and is considered a common card, except for the error in background color. The card is supposed to have a bright yellow background, but we think that the yellow ink ran out while printing this card. A Topps, Bowman, or any other Pre-War baseball card that would have a minor background variation would not be a big deal, but the Goudey company was very careful about errors and probably caught and destroyed hundreds if not thousands of cards like this. We're always looking for unique items like this and it is always fun when we find one.